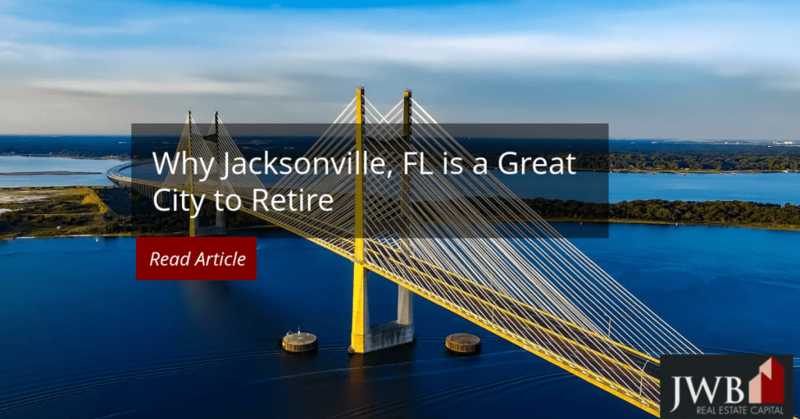 The search for the perfect retirement location could start and end in Jacksonville, FL As a city it has the notable distinction of being the nation’s largest city in terms of physical area but without the crowds associated with more populous areas. The Jacksonville area has deep roots in Florida’s military history, it’s home to Fortune 500 companies, has a dynamic presence in health care and technology. Even so, it’s an affordable place to live that offers its residents an ideal climate and a diverse physical and cultural environment. Here are just a few of the reasons that Jacksonville, FL is a great city to retire to and spend your golden years doing the things you love. Because the climate in Jacksonville is more moderate than retirement destinations to the south, you won’t be restricted in your activities during the heat of the summer. While you won’t have the balmy afternoons at the beach in January like they do in Miami, you’ll have a longer season to enjoy the outdoors long afterwards southern Floridians escape to their air conditioners. Jacksonville has the largest urban park system in the U.S. It encompasses 80,000 acres spread out over 337 parks. The parks cover natural and manmade environments, run along the St. John’s River and stretch far into northern Jacksonville. Big Talbot Island State Park has seven smaller parks within its boundaries and exemplifies the coastal environment in the northern Florida region. If you’d like a truly unique camping experience, sign up for a night or two in their hammock section of the campground. While you’re relaxing, keep your eyes out for the animal life like marsh rabbits, armadillos, bobcats, white-tailed door and raccoons. Closer to home, you’ll find plenty of areas for fishing, golf, swimming, tennis, daily walks and cycling. The city has more than its share of shopping areas from regional, upscale mall at St. John’s Town Center to neighborhood shopping for day-to-day needs. Florida in general is a veteran-friendly state, but among all the major cities, Jacksonville has been ranked as number one for providing veteran-friendly services. It has a full service VA hospital that serves northern Florida and parts of Georgia. The city has a formidable naval pilot training program at NAS Jacksonville Naval Base. Compared to other cities in Florida, Jacksonville offers a good value for the money when it comes to housing. Its median price in the first quarter of 2018 stood at $163,642, lower than Tallahassee’s medina of $171,075 and $208,132 in the greater Tampa area. The median rent for Jacksonville for the same period reached $1,199. Homes are a good investment in Jacksonville. The values continue to climb annually. There are plenty of new homebuilders in the area, some of whom specialize in upscale 55+ communities in resort-style settings. See also Are You Saving Enough for Retirement? The University of Florida has a top-notch healthcare campus in Jacksonville. They offer the JAX-ASCENT program which matches seniors to clinical trials. The Mayo Clinic in Jacksonville and the Baptist Medical Center round out the local health care providers, both of whom have earned national reputations for top medical care in the U.S. If you’re not quite finished working, you’ll find the employment market in Jacksonville easy to navigate. Largest employers are the military, public schools, banking and healthcare. The unemployment rate stands at 3.5 percent. Given the economic stability that the federal government provides, Jacksonville is relatively immune to the normal ups and downs associated with the private sector.